hence as per Elliott the implusive wave 5 range could be in the range of 10,100 to 10,550. The Fabonaci extension also indicate the 100% extension level 10,550. Corrective waves a, b and c lenght is calculated upon completion of implusive wave 5.
times of wave a or beyond. But remember i less believe in technicals for KSE100 index only, technicals do work in intl markets of forex, commodities, etfs, futures etc. etc. You have taken a lot of trouble (for a non-believer) to plot EW projections on the KSE. :welldone:. I scared from my own chart. As Fabonasi and Elliott theory are very popular way of trading in international markets. Hence I should avoid shorting for day trading. "Wow, I can't believe it!!! I highly recommend it to anyone who needs a tax write-off"
yaar is ka ami k liye code mil sakta hay ????? Bhai above Elliot Wave(s) analysis has failed badly then y u need it. 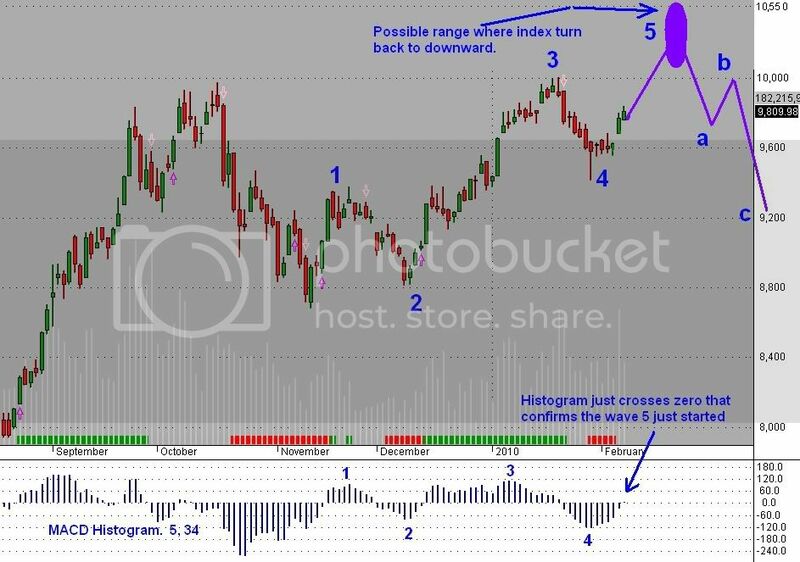 yaar ive been studying elliot wae for quite some time but cant find some goood indicator which can wount waves for me plus i like the histogram thing so can i get the codes???? It's ok but how do you see the 4 previous waves that resemble converging triange? If these are 5 waves, then predominant trend is up. positive EASI, which indicates that the target has not yet been reached. This is a positive signal! Three consecutive wave degrees show a clear POSITIVE trend, starting with the Minute wave degree but the most likely, though conservative target seems to be reached already. Prices are likely to rise further as long as all trends stay UP.